Today is 33 days since I saw the sun for the last time – (Friday Photo 309). It was a windy day and I was at this exact same spot, watching the sun hover just over the horizon next to Skottind. And it will likely be this spot that I will see the sun again for the first time this year – though hopefully while on my way to a mountain. Just like we don’t know we’ve seen the sun for the last time until it eventually doesn’t rise again – we never know when the sun will return. 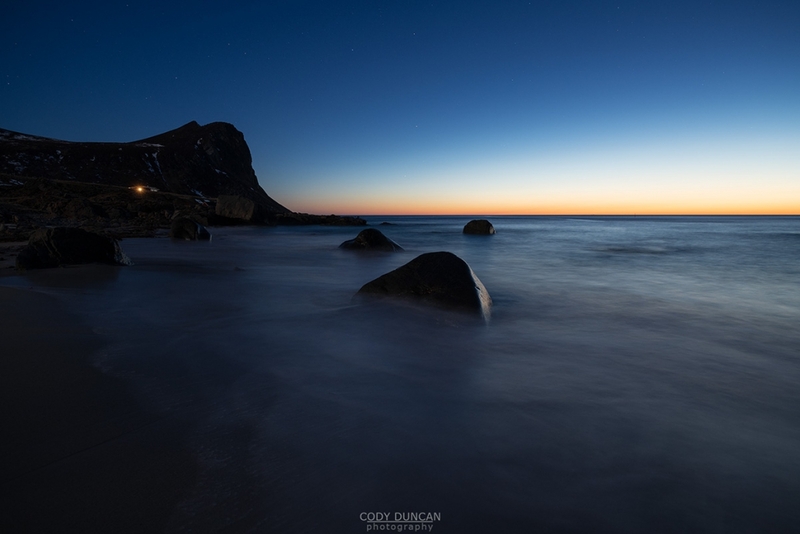 Tomorrow the sun crosses the horizon (depending where on Lofoten you are), after that it is simply a waiting game for the southern horizon to be clear enough – which is not looking too good for the next few days at least. Last year January 10th was my sun-return-day, the previous year, January 12. But the exact day doesn’t matter too much, simply knowing the sun will soon be back is enough to lift one’s spirits. 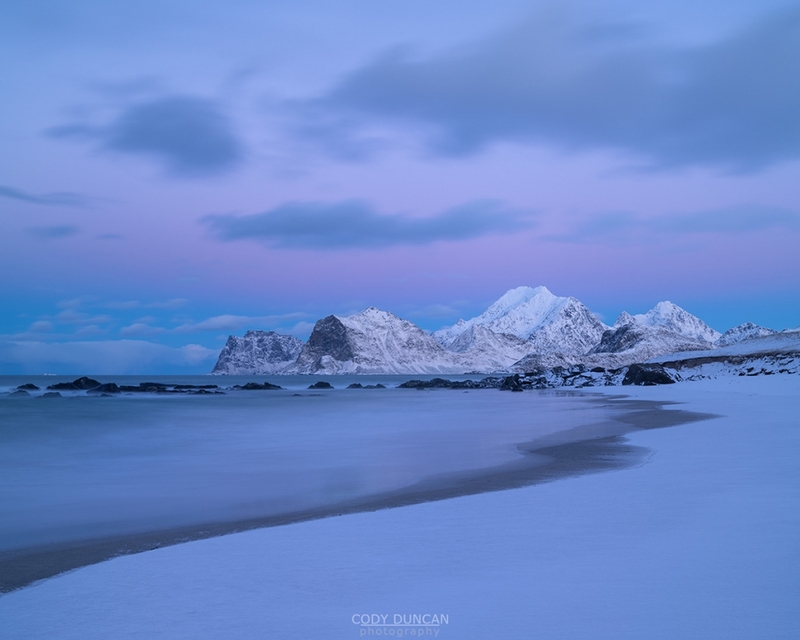 This was now my 3rd polar night living alone on Lofoten. And in all honesty, the novelty of the experience has long since faded. I dread November and what I know is coming – especially this past year when it has rained almost non-stop since August. I can feel my mind grow heavy and I just want to sleep. And working from home, I can begin to feel a bit stuck – last year I actually was! Maybe I only leave for an hour or two at the gym or climbing wall most days. Or even just a coffee in my favorite cafe to have some lights other than my own and hear the voices of people. Next year I’m going to Spain and learning how to paraglide – Or maybe Patagonia for a long walk. Where doesn’t quite matter, but I will do my best to leave. With 2019 coming to a close in a few days the mostly mild winter continues. 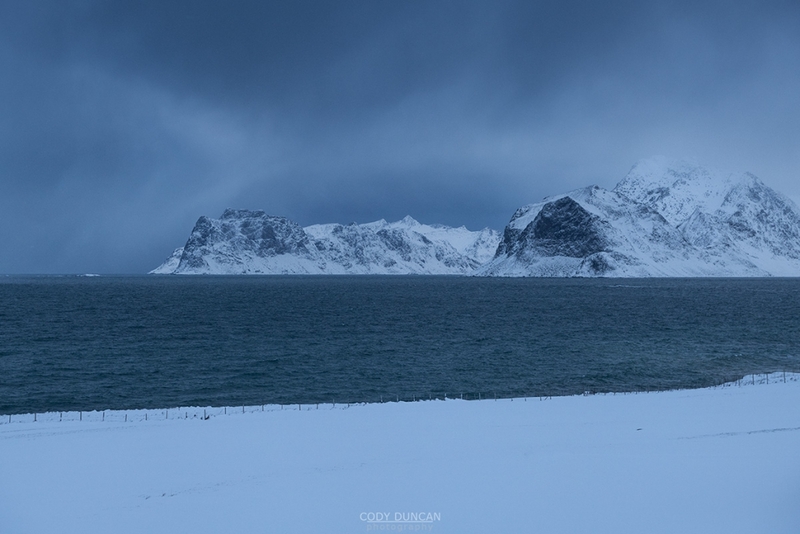 Compared to last year at this time (Friday Photo 260) when Lofoten was cloaked in white of a deep freeze, it’s mostly just been grey, wet days here in the west. But that is how it goes some years. I attempt to keep these Friday photo posts as relevant as possible to current conditions these days. But realistically, I’ve barely hiked much since October and hardly photographed anything but a handful of northern lights since then as well – and those have been somewhat few and far between. The darkness and grey just leaves me a bit unmotivated. But today, I at least managed to wander down to the beach for a fresh image. 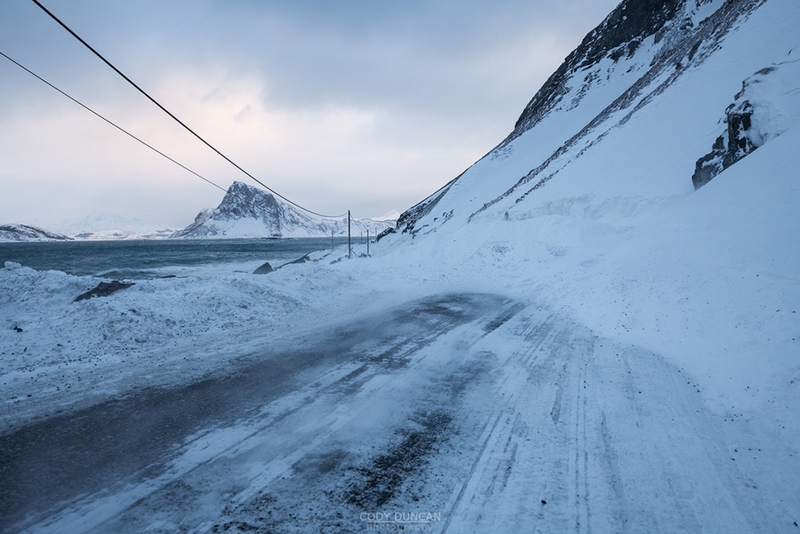 Mostly to show that there’s not much snow currently here in west Lofoten – There is more as you go further east. The mountain in this image, Stettind is over 500 meters high, so you can see that there’s not much snow yet. When it will come, nobody knows. Last year I had my first ski days a bit after the new year. That probably won’t happen this year. On the bright side, just over a week until the sun returns – weather permitting of course! 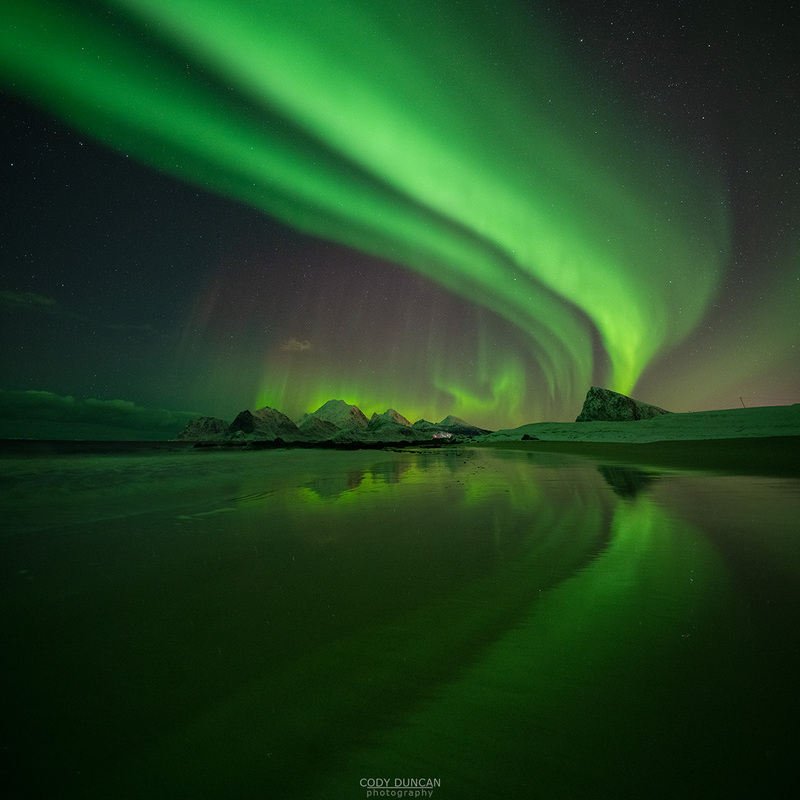 It also means the the aurora season is half way over – with around 3 1/2 months left of northern lights dancing across the night sky of Lofoten. My first sighting of the aurora this season was August 26, yes, it starts that early, while my last sighting from the past season was April 13. So on either side of the season, the first/last aurora are visible on Lofoten about a 3-4 weeks before/after the autumnal and vernal equinoxes. It is quite a long season actually. 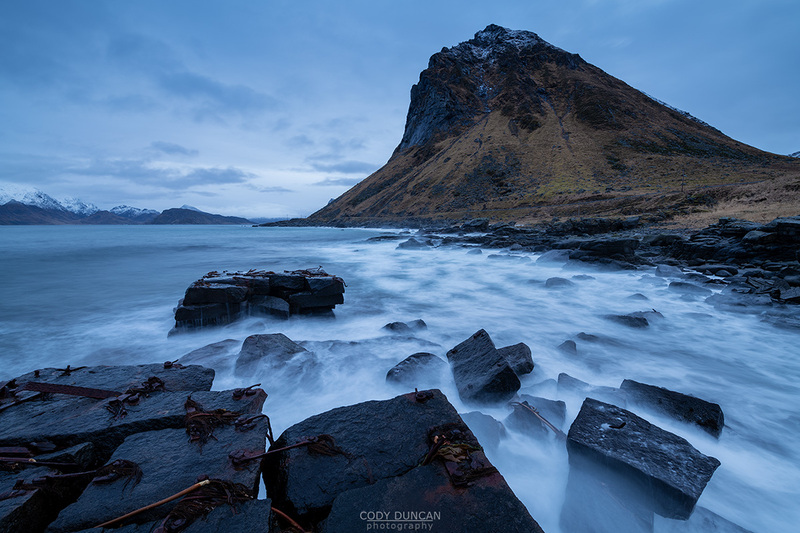 Really the longest that any weather or seasonally related phenomenon occurs on Lofoten – encompassing the end of summer, autumn, winter, and perhaps the early days of spring, though I think April still counts as winter here other than the daylight hours. 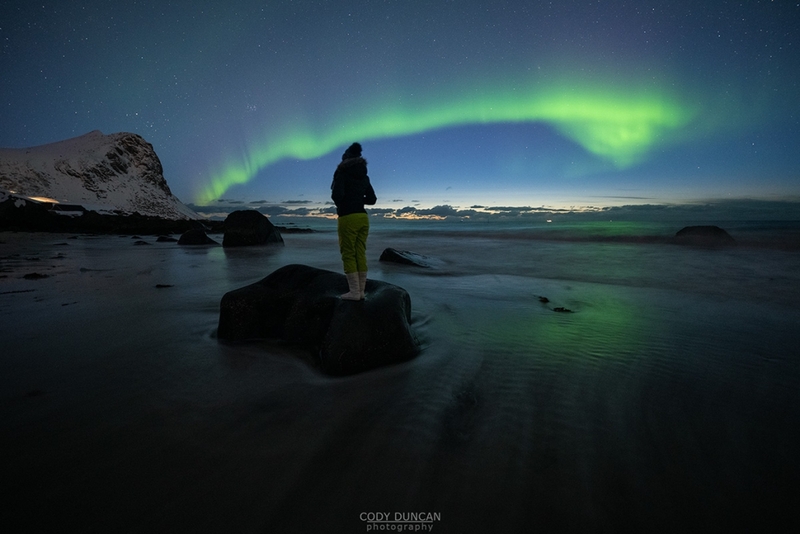 While we’ve had some big aurora nights this year, including this photo, which at its peak that night, was filling the southern sky – perhaps the biggest aurora of the season so far this year. The cloudy and stormy weather has meant the northern lights have been a somewhat rare gift. Even with forecasts calling for clear skies we’ve ended up with clouds. And on some of the rare clear nights, the sky has remained quiet – at least by my, admittedly slightly spoiled, standards. But when the aurora has arrived, it has often been good! This night, Friday 2 weeks ago, I took over 600 images, which is quite a lot for me. And every time the sky would seem to die out and i’d put my lens cap on and walk away, it would soon erupt again! A fantastic show for well over an hour! 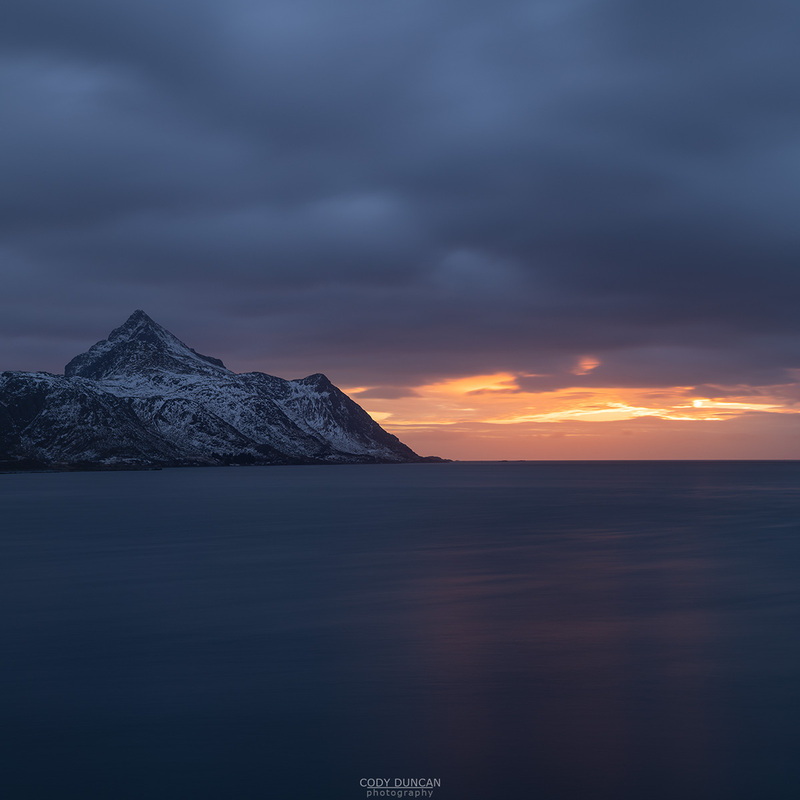 The sun has finally set on Lofoten for the year. A though it remains below the southern horizon at noon, on clear days – kinda rare this year – we still have some magical light before the darkness returns by early afternoon. At time it can feel as if the whole world is glowing in a pastel twilight. While other days the clouds and rain only bring deep shades of dark blue and grey, they sky mirroring the sea, and only allowing us a short glimpse of the word beyond the streetlights. November is already a dark and often stormy month here in the north. So the beginning of the Mørketid isn’t sudden. It is just a slow fading of the light until one day you look at the calendar and realize you’re not going to see the sun again for a while. 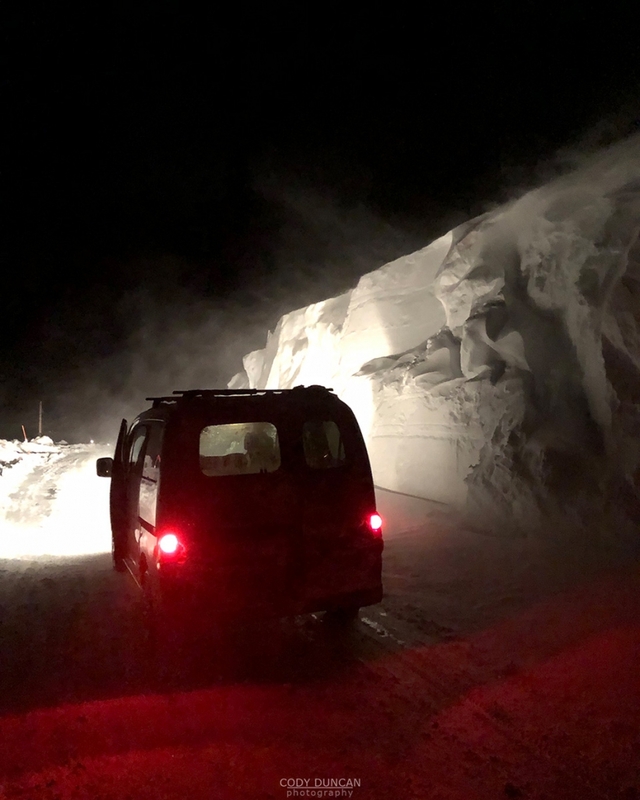 And so it is, the Mørketid – the dark time here in the arctic. 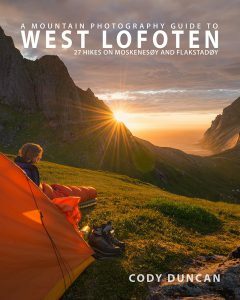 But Lofoten really only experiences a light version of the Polar night, nothing like the 2 months of darkness the people up in Finnmark experience. 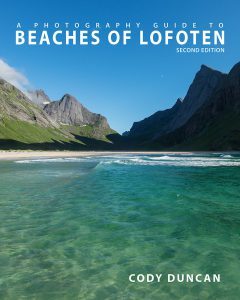 It is strange to think – as far north as Lofoten is, there is a whole lot further north to go in Norway! Nothing technical about this image. 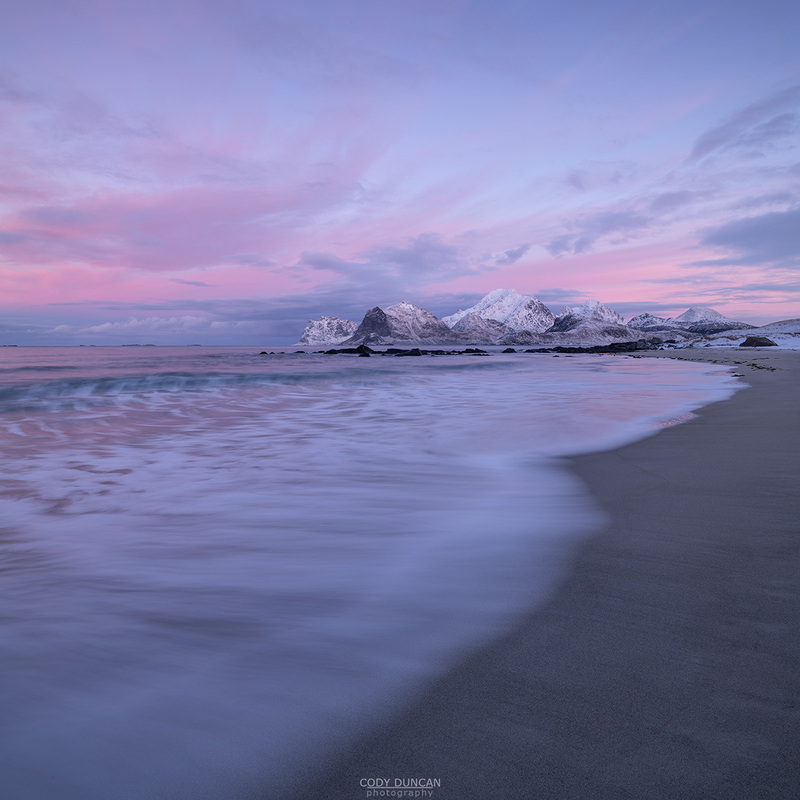 I was passing the beach on my way home from Norwegian class – luckily we got out a bit early this day – and saw the world was glowing. So I quickly went home to grab my camera and then headed back. There had been some glow on the distant Himmeltind when I initially passed, but I unfortunately missed that.